Following a vigorous PETA campaign that included more than 100,000 protest e-mails, countless critical social media posts, scathing media stories, and phone call blitzes to the company's U.S. offices, Kikkoman—the most popular soy sauce company in the U.S. and Japan—ended its long-standing practice of experimenting on animals. The company announced this morning that "Kikkoman has made a commitment that no further animal testing will take place." Thank you for participating in our call-in campaign, which was a vital part of this victory. Kikkoman received countless calls from people insisting that they would boycott its products until it stopped testing on animals, and the company listened! For more than 15 years, Kikkoman has conducted experiments in which animals were cut open, force-fed soy and other food products, blasted with radiation, and decapitated just to make dubious health claims—including about sexual behavior—even though authorities have clearly stated that animal experiments cannot be used to substantiate human health claims about food. Kikkoman joins a growing list of companies—including PepsiCo, Coca-Cola, Barilla, Ito En, Welch's, Lipton, and Ocean Spray—that have worked with PETA to end animal tests. Octobe 2015: PETA recently discovered that Kikkoman Corporation, the popular soy sauce company, has been conducting and funding cruel and deadly experiments on animals in order to make health claims about its products. 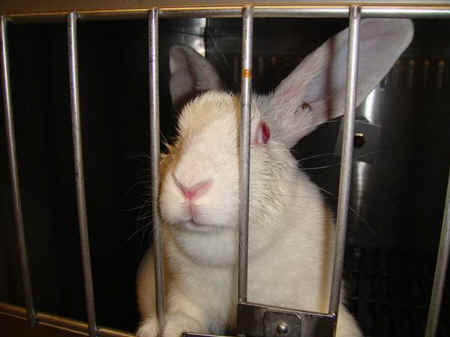 Please urge Kikkoman to modernize its research program and join progressive companies like pasta maker Barilla and beverage makers Coca-Cola, Welch's, and Ocean Spray, all of which have established policies against funding, conducting, or commissioning experiments on animals. Feeding tubes were repeatedly forced down rats' throats to administer fermented soy milk. Rats were force-fed soy sauce through surgically attached stomach tubes, after which they were "sacrificed by decapitation … followed by rapid removal of the brains." These types of cruel health claim experiments are not required by law, and there are more relevant non-animal research methods—including tests with human tissues and human volunteers—available that are humane and can actually establish the health benefits of food products for humans. PETA has repeatedly contacted Kikkoman to share information about modern non-animal research tools that can better meet the company's objectives and save animals, but it has refused to meaningfully address the issue.